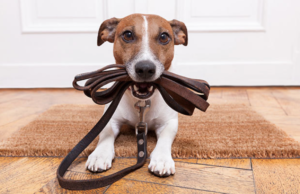 Buying collars and leashes online is convenient, but a good, safe fit is more important. Visit a pet supply store and try them on your dog. Ask a trainer if you need assistance. Dogs can feel when you’re in control, so always walk with confidence. Avoid distractions – like your phone – and keep your dog alongside of you. If he’s walking in front, you can trip and you have less ability to manage him. Give your dog some freedom. When the time is right to go potty or allow sniffing, hold the leash comfortably with 4 to 6 feet of slack in the line. It should be enough to allow your dog to walk away to go potty, yet easily be guided back in as the walk begins again. Protect from the cold weather. While snow and ice can irritate paws, salt and ice melts can be dangerous to your pet’s health. If your dog can tolerate booties, this condition warrants using them! Always clean paws after being outside. If you suspect that your dog has ingested ice melts, contact a veterinarian immediately. Walks are a great opportunity for training. If your dog pulls, stop immediately. After a pause, move forward. If he doesn’t pull, reward with a treat! If your dog continues to pull, it may be time to talk to a professional. Pulling is not only unpleasant, it also prevents you from maximizing the amount of exercise you get out the walk. All of our classes – Puppy, Basic Foundation and Private – work on leash training. Contact us for help!